The Viewer module is used to view and analyze material data of any complexity. 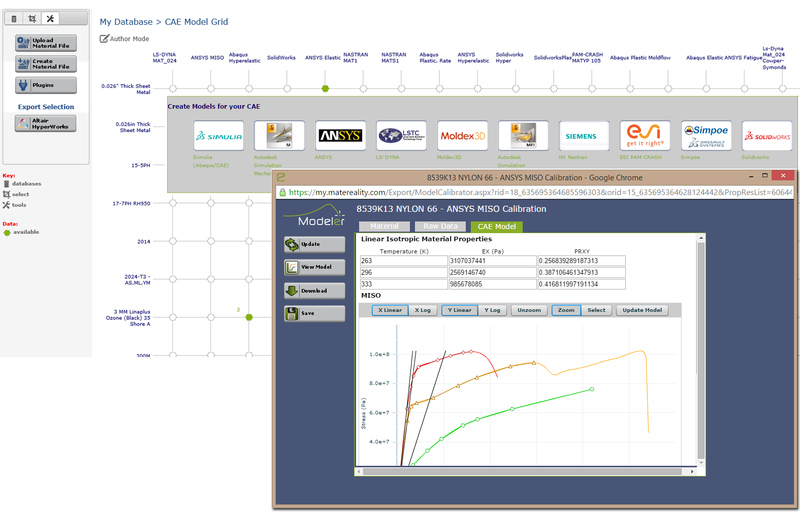 The Modeler module transforms raw material data into CAE-ready input material cards. 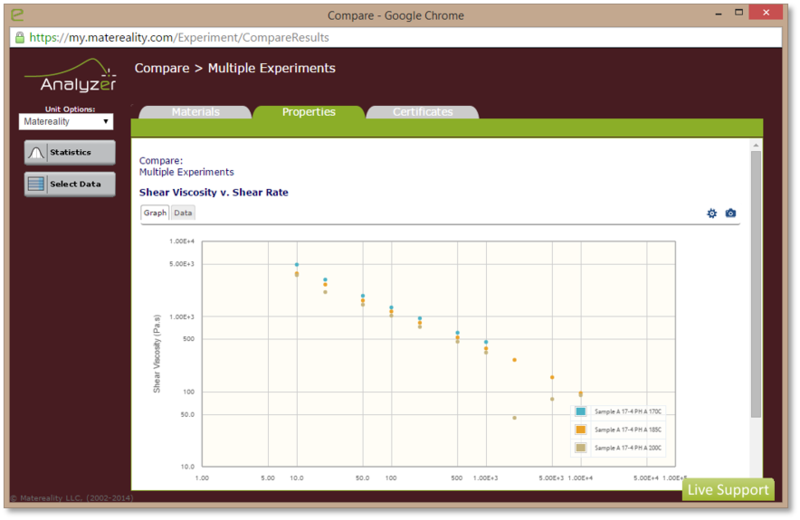 The Analyzer module provides analytical tools to compare and contrast materials. 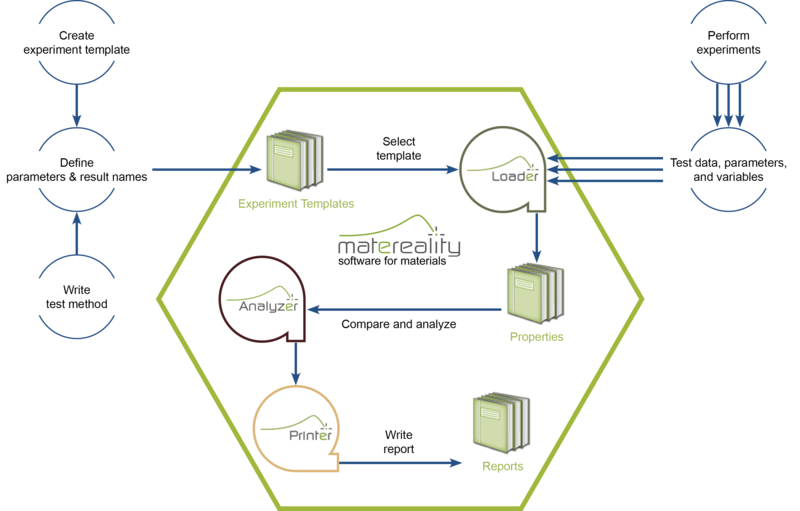 Collect material cards created for your CAE applications using Matereality’s CAE Modeler software, or upload material cards you have created externally for safe and documented storage. Collect and classify the materials of your enterprise in one place, along with associated composition, multi-step processing, certifications, availability, MSDS, datasheets, etc. Collect material specifications for your enterprise, with required property targets and ranges as well as other acceptance criteria. Check candidate materials for acceptance with the specification. Collect any properties of all the materials of your enterprise in one place. Handle design properties as well as quality assurance data. Apply historic comparison statistical analytics or compare any properties of any materials for design decision making. Collect test reports (PDF, scanned documents, Excel, Word or other) for archival/reference. Link these reports to the digital data stored in other libraries, such as Materials or Properties. Collect experiment metadata, including test protocols, subject definitions, experiment parameters and results. Software to upload material properties to your database. View and manage the materials in your database, detailing composition, processing, availability and other related data. 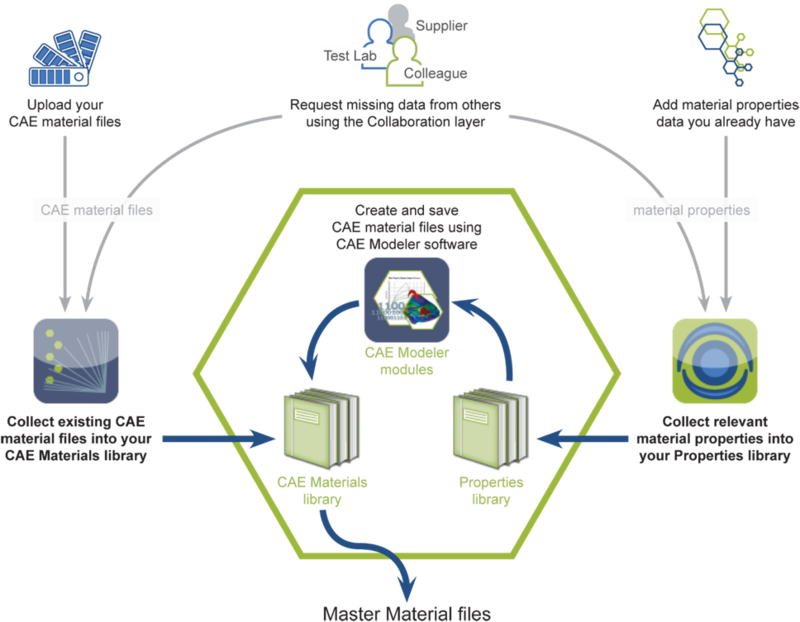 View, edit and manage material cards that you have previously created and saved using your CAE Modeler software. 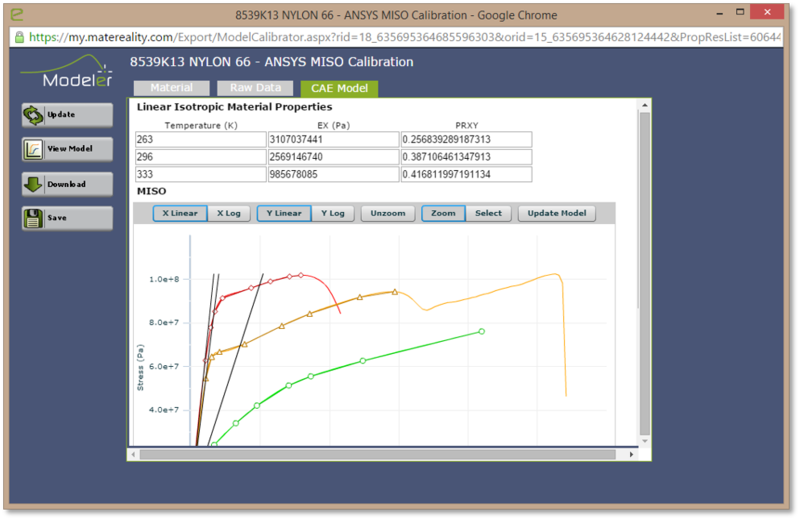 Use dedicated software to locate material data for specific CAE material models, calibrate the material model and write an analysis-ready material card. Perform targeted searches of the selected database to extract design properties such as stress-strain curves, viscoelastic properties, hyperelastic data and more. A birds-eye view of the selected database. Use search functions to locate data by property, material name, class and supplier. A collection of free databases from material suppliers and other qualified data sources. View materials and their properties assigned to a material specification. Manage and edit material specifications. A Process for Creating, Managing and Deploying Materials in ANSA, by H. Lobo, E. Strong, and Y. Kolokythas, was presented at the 7th BETA CAE International Conference in Thessaloniki, Greece. New Generation Modeler for LS-DYNA Material Parameter Conversion, by E. Strong and H. Lobo, was presented at the European LS-DYNA Conference 2017 in Salzburg, Austria. Datapoint 23.2 e-bulletin: Matereality v11, Upcoming Presentations. Datapoint 23.1 e-bulletin: New Test Capabilities, Matereality v10.2, Upcoming Presentations. Version 7 introduces new productivity tools, enhanced collaboration and publishing capabilities, and a fully updated CAE Modeler suite for converting raw material data into material cards for CAE applications, as well as other enhancements. Moldex3D Announces Embedded Connectivity to Matereality CAE Modeler. 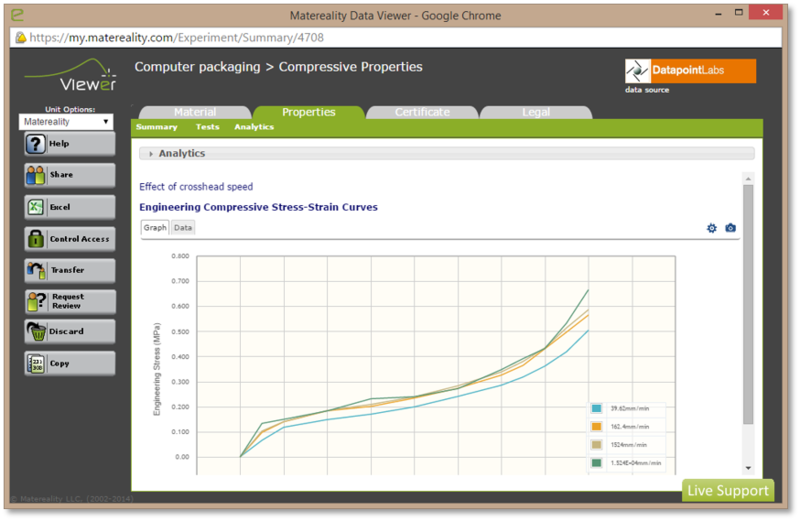 Matereality-Moldex3D Interface allows direct export of properties for plastics injection molding-simulation. "Matereality for Abaqus/CAE" plug-in deploys Matereality within the Abaqus environment. Matereality wins Emerging Providers of New Technologies grant, DaratechSummit2006 Boston, Feb 20-22nd, 2006. NIST Lead-Free Solder Database now available on Matereality. Matereality 2.1 is now ready Press Release. 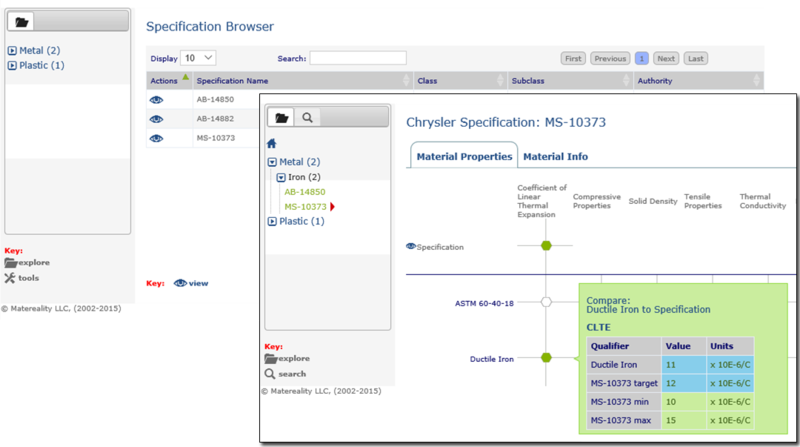 The latest release showcases the new Material Data Server and Material Databases products and also a number of new features. White paper on enterprise-wide material data management presented at NAFEMS World Congress 2005, Malta. ANSYS, Inc. and Matereality, L.L.C. announce interoperability. Matereality 2.1 is now ready: Press Release. The latest release showcases the new Material Data Server and Material Databases products and also a number of new features. May 11, 2004: ABAQUS joins Matereality Collaborative Channel Program with goal of seamless connectivity between products. July 10, 2003: Matereality® launches Data Delivery Service(DDS) for secure, same-day delivery of test results by testing labs to client's desktop. October 29, 2003: "Designing the Next Generation Material Data Management System," Hubert Lobo; Testing Expo 2003, Novi, MI. October 9, 2002: Matereality® is prelaunched at the CADFEM Users' Meeting. Click on WebCast to see this introduction.